Faith is not the easiest thing in the world. To love, cherish and trust in something you can't see is difficult, but therein lies the real test of faith. Psalm 31:24, "Be strong and let your heart take courage, All you who hope in the LORD." Have faith in the Lord and be steadfast in your beliefs. 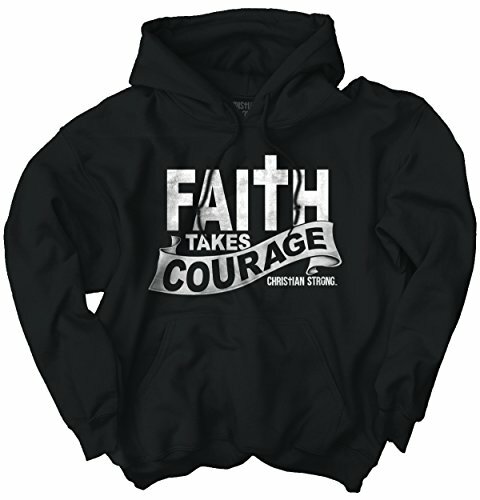 This classic design makes sure you remember that it's all about faith! This unisex graphic hoodie is a full cut regular adult spec. This type of hooded sweatshirt is for a looser fit. Please review sizes before you buy, we want you to be satisfied with your purchase! This is the most purchased standard 50/50 (cotton/poly) hooded sweatshirt for adults. Please make sure you buy the right size for you: Adult Cut (Chest/Length) - Small 40"/27" Medium 44"/28" Large 48"/29" X Large 52"/30" 2X Large 56"/31" 3X Large 60"/32" 4X Large 64"/33" 5X Large 68"/34"
The shirt fabric is 8.5 oz, 50% cotton 50% poly preshrunk fleece, which is very comfortable. If you have any questions about this product by Christian Strong, contact us by completing and submitting the form below. If you are looking for a specif part number, please include it with your message.